In early 2013, in his State of the Union address, President Obama urged the Congress to "guarantee that the next revolution in manufacturing is made in America." To that end, the President highlighted the central role of one revolutionary emerging technology. In his own words, "3D printing (that) has the potential to revolutionize the way we make almost everything." The President emphasized benefits from innovation in this promising field, alluding to the transformation of "a once-shuttered warehouse" in Youngstown, Ohio into the state-of-the-art National Additive Manufacturing Innovation Institute. Referring to his proposed creation of a network of manufacturing hubs, Obama insisted that there is no reason why 3D printing innovation initiatives should not spread around the entire nation. In fact, federal R&D tax credits are available to assist companies willing to take part in the imminent 3D printing revolution. Different 3D printing processes are available to process diverse materials. Examples include fused deposition modeling (FDM), used for thermoplastics, eutectic metals and edible materials; selective laser sintering (SLS), for thermoplastics, metal powders and ceramic powders; electron beam melting (EBM), used for titanium alloys; laminated object manufacturing (LOM), for paper, metal foil and plastic film; and stereolithography (SLA), applied to photopolymers. The first crude 3D printer was invented about 30 years ago by Chuck Hull, co-founder of 3D Systems, a leading provider of 3D content-to-print solutions. Since its first rudimentary application, the technology has become indispensable to a number of industries. It was initially used in the production of prototypes, particularly in aerospace and automobile companies. With time, however, 3D printers evolved in capacity and ability to process different materials and that has allowed for its ever growing use in the creation of final products ranging from medical implants and footwear to jewelry. 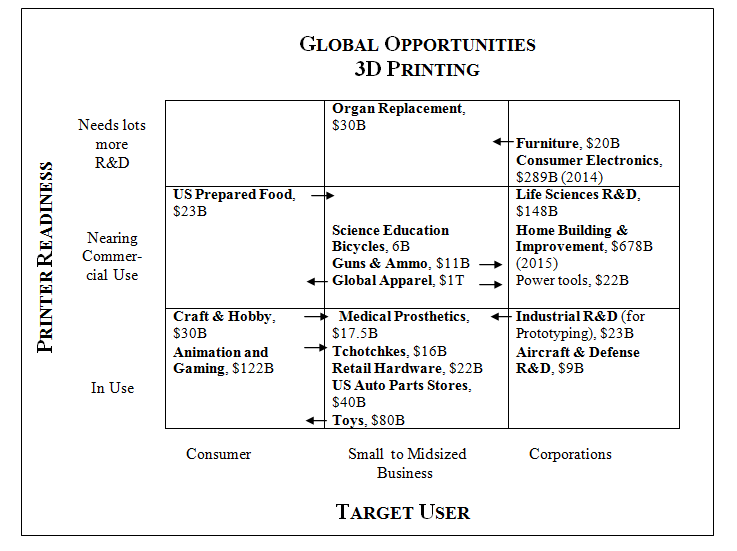 The following table, originally published by Forbes Magazine, presents an interesting overview of industries with 3D printing applications, the readiness of the technology, and potential users (cross-segment uses are represented by arrows). Even though progress has been made, there are still hurdles to clear before 3D printing is adopted into production manufacturing processes. Among the current challenges to existing technologies are the limited speed and volume at which objects can be printed and the high costs involved. The revolutionary potential of 3D printing, however, is unquestionable. Many believe that this technology will change the world as we know it. Steve Faktor, founder of startup incubator IdeaFaktory, author of Econovation (Wiley, 2011), and former head of the American Express Chairman's Innovation Fund, compares 3D printing to the internet: "Just like the web revolutionized entertainment, shopping and communication, 3D printing will power a local and personal industrial revolution." Its effects on product availability, energy use, customization, and waste will transform the way industries function, from construction, sciences and medicine to art and, most clearly, manufacturing. Recent developments exemplify this revolutionary potential: early last year at Cornell University, researchers announced the development of 3D printed artificial ears that are practically identical to real ones, both in resemblance and functionality. Seimens recently announced that they will start printing spare parts for gas turbines, becoming one of the first global industrial manufacturers to routinely produce metal products using the innovative 3D technology. They will use 3D printing to speed up repairs and cut costs. In certain cases, they anticipate that the time taken to repair damage in turbine burners will be cut from 44 weeks to four. Although auto manufacturers have not started using 3D printing for mass manufacturing, they are using it for prototyping and potentially saving a tremendous amount of time and money in doing so. For example, an auto company can produce a prototype engine part that would usually take about four months and cost $500,000 in about four days for a cost of $3,000 using 3D printing. The future of 3D printing looks even brighter as research advances in the development of a new, and less onerous, method to produce titanium, largely used in printers. According to a recent article from The Economist , Metalysis, a small British firm, has developed a promising process that uses electrolysis on powdered oxides, which would significantly reduce costs of 3D printing. The technology is expected to skyrocket with lower prices and foreign built printers in 2014 at the expiration of key patents. The technology currently covered by patent is the SLS technology, which is the lowest cost method of 3D printing. In his recent book, "Makers, the New Industrial Revolution", Chris Anderson highlights a fundamental aspect of the 3D printing revolution, which he denominates the emerging "Maker market." With access to open-source design and 3D printing, entrepreneurs are engaging in micro-manufacturing and creating a tsunami of highly customized products, produced in small quantities and at higher margins. The author points out that some of the industrial giants of professional design and engineering are shifting their focus to this emerging market. Autodesk, PTC, and 3D Systems, for instance, have recently "released free design software for amateurs and even kids, along with service bureaus that let them upload their designs and have them 3D printed or laser cut." R&D expenses are increasing throughout the entire 3D vertical industry, ranging from the 3D printing manufacturers themselves to their end-user customers. While the increase in 3D design software availability is directly affecting small businesses and individuals, a wide range of product manufacturers are inserting 3D printing in their core businesses. The following table illustrates the recent exponential growth in R&D investment for two 3D printing industry leaders. Proto Labs went public in early 2012 and in late 2013 announced record revenues for their 3rd quarter; 29% above the 3rd quarter for 2012. R&D spending was $9.1 million in 2012 and $8.4 million in the first three quarters of 2013 alone. ExOne went public in early 2013 and has announced it will invest its capital in innovative materials for its 3D printing systems. In a marked difference from its competitors, which focus both on the consumer and commercial sides of 3D printing, ExOne concentrates solely on printers for large industrial companies, such as aerospace and automotive. In mid-2013, Statasys announced that they will be acquiring desktop 3D printing company MakerBot in a deal worth $604 million. They also later announced 116% in revenue growth and that large companies such as UPS will begin selling 3D printing services in some of their retail stores. 3D printing represents a unique opportunity to revamp the U.S. economics of manufacturing and restore the country's leading position as an innovator. The domestic production of such revolutionary printers is bound to boost revenue and job creation in the manufacturing sector. Additionally, the diffusion of such technology will significantly expand economic prospects for individuals and small businesses. Companies engaged in 3D printing R&D activities should take advantage of federal tax credits designed to accelerate the necessary breakthroughs that will open the way to a new future.